The electronic submission from is available at: http://go.lehigh.edu/campbellprize. The submission deadline is May 4th, 2019. 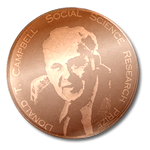 The annual Campbell Prizes, which honor the memory of distinguished social scientist Donald T. Campbell, recognize outstanding social science research conducted by Lehigh students. Donald T. Campbell passed away on May 6, 1996, leaving a legacy of high standards for social science inquiry to Lehigh University and the national and international social science community. He was University Professor of Social Relations, Psychology, and Education at Lehigh University until he retired in 1994. Campbell received his A.B. and Ph.D. from the University of California at Berkeley, and he held teaching positions at Northwestern University, Syracuse University, University of Chicago, and Ohio State University. During his career, he also lectured at Oxford, Harvard, and Yale Universities. The Campbell Prize honors this aspiration for excellence. Prizes of $1000 each are awarded to the undergraduate and graduate papers in the social sciences, broadly conceived, that are of the highest quality, methodological originality, and societal significance, as embodied in the work of the late Donald T. Campbell. Donald Campbell and his remarkable career earned a New York Times obituary and a Lehigh University faculty memorial resolution. © 2015 Lehigh University. All Rights Reserved.